Bring the fairy tale to life with this three-dimensional play set. Looking to create a dollhouse that's "just right" for boys and girls to enjoy together, designer and mother Kara Dyer created this whimsical set that brings the classic fairytale Goldilocks and the Three Bears to life. Little tykes can take turns building Mama, Papa, and Baby Bear and their forest tree house with a working swing and a tree for for Baby Bear. Like the story, there's a bowl of porridge, a chair, and a bed for each cuddly bear (and Goldilocks, once she lets herself in!). The side of the toy house folds in half to make a swimming pool. Read the included picture book, then use the characters included to act out the tale and create your own plot twists! For extra inspiration, find DIY projects at the back of the book. Made of lightweight EVA foam and high-quality card stock, the house and furniture pieces easily fit together like a 3-D puzzle and fold flat in a portable carrying case conveniently designed to fit on your bookshelf; no tools, screws or glue required. Made in China. 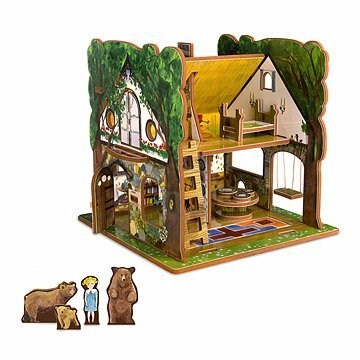 Click here to see Goldilocks and the Three Bears Toy House assembly instructions. I paid more than $60 with tax and shipping for a product that my grandchildren can't play with because the pieces are too big for the playhouse. When she reaches for one piece another piece falls over . The roof doesn't fit properly and looks makeshift. This is the kind of toy he enjoys playing with on his own for hours, though he'll also especially enjoy when others join in. I would definetly buy this again. I loved the imagination it brought to his play. I would buy all of their products including this one again. My Granddaughter has a great imagination and loves to read and he read stories so this is literally a perfect gift! Best way to tell a story! This was a great gift for a very special little girl. I'm glad I made this purchase, it has been very rewarding. This set was perfect for my daughter who loves to assemble things and do puzzles. She's three and was able to put the house and all of the pieces together herself and have quiet, imaginative play. We have since taken apart and reassembled many times and it has been sweet to watch her play along with the parts while I read the book to her. It has brought us many hours of quality time together! I love that my kids can play together. The 3 year old acted out the story, while her older sister read the book to her. It was perfect. Easy to play with. Fun too!